I know, you're probably sick to death of christmas food. But I can't help sharing this recipe with you. It's so fresh and yet with christmas flavors - you really have to try it. It's dead easy, and takes about five minutes to prepare. Goes perfectly with salty, rich foods like ham or turkey, but it'll be fine with a simple steak, too. Peel the oranges with a knife to get rid of any white bits. Slice thinly. 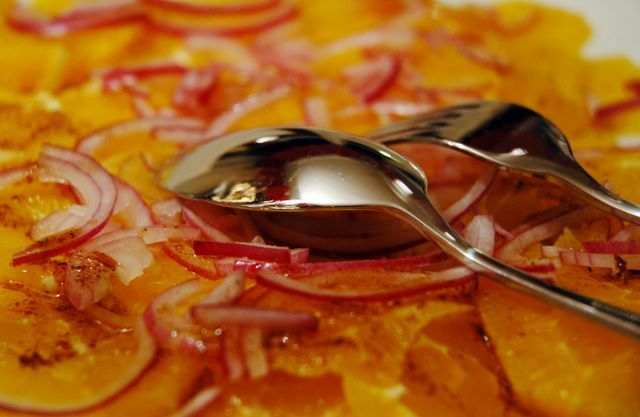 Slice the red onion thinly, too, and arrange with the orange slices on a plate. Use a pestle and mortar to grind the spices. Add vinegar and olive oil, and maybe a few grains of salt. Drizzle over the salad, and serve. I'm not sick to death of your posts at all. I've not really begun to make much yet. I'm absolutely going to make this tomorrow. I have everything on hand & it would not have occurred to me to make it w/out spinach. I'll be making your Swedish meatballs & a couple of other things in the next 2 weeks. Thanks! What gorgous colors and who can get enough of fresh and beautiful salads for the x-mas table? !